Description: Dorset Midsummer Music Festival is a family friendly music festival set in an area of outstanding natural beauty. 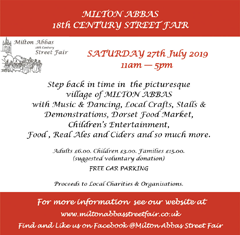 With a range of great music, children's entertainment, stalls and a holistic zone alongside a wide selection of food and drink, this is a great couple of days out. If you want to make a proper weekend of it, camping is available in this area of outstanding natural beauty. Since it was founded in 2014, there's been a mix of music from local school talent clubs to internationally renowned acts like Ben Waters, Lionstar and Neil Cowley & Mission Impossible, as well as amazing local acts like DD Allen and Mi3. Children's entertainment has included the amazing Jamie Jigsaw with a wealth of Circus tricks and Bugfest for the brave Food has included Thai, wood fired pizza, hog roast, falafel and much more. Drinks have included local beer, cider and award winning sparkling wines, alongside the Pymms tent. Adult	£8.00 per ticket Child	£3.00 per ticket Family	£27.00 per ticket Please let us know you saw us on What's On in Dorset!